One of the hot topics at conferences this year may come as a surprise to you. It doesn’t involve new treatment paradigms for diabetic retinopathy or the latest and greatest iteration of OCT angiography. 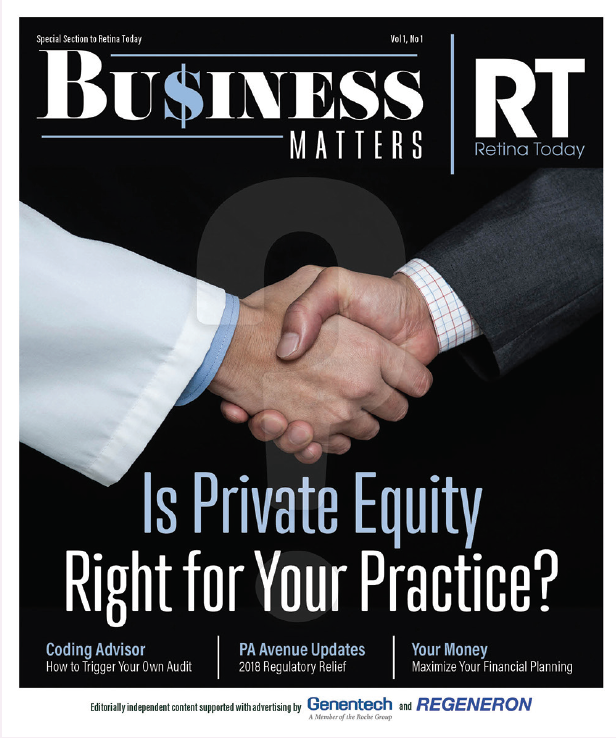 Rather, it has to do with a trend that appears to be on the rise in ophthalmology: the purchase of ophthalmology (including retina) practices by private equity (PE) firms. For the graduating retina fellow, the concept of PE may introduce additional uncertainty and anxiety to the job search process. 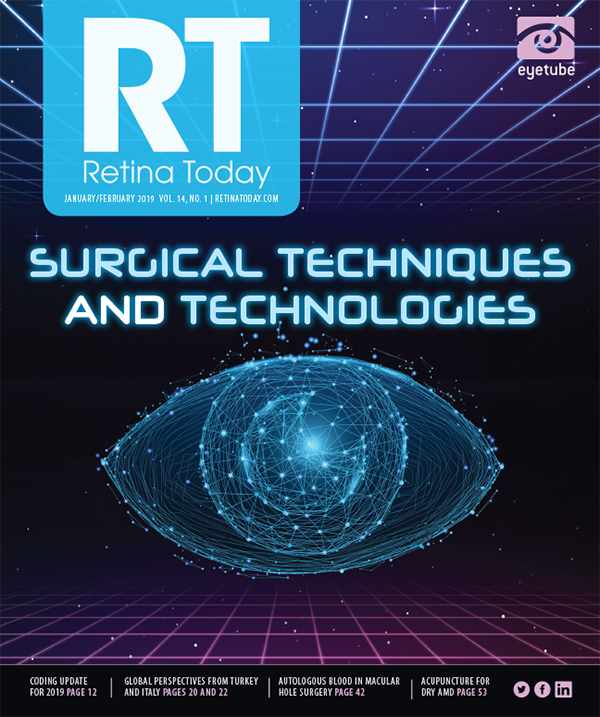 Retina Today invited James F. Vander, MD, and Guarav K. Shah, MD, who are both familiar with PE, to discuss its role in the practice of retina and how it might affect fellows in training. Daniel Su, MD: Why are PE firms purchasing ophthalmology practices and, specifically, retina practices? James F. Vander, MD: PE firms have been purchasing medical practices for years, including, to a modest degree, ophthalmology practices. Most of the original interest from PE firms in medical practices involved hospital-based specialties such as radiology and anesthesiology. More recently, however, a move toward select outpatient-based fields like ophthalmology has occurred. Ophthalmology has traditionally been a high-volume, high-revenue field. The presence of ancillary sources of revenue, such as optical sales and ambulatory surgery centers, helps make it more appealing to PE firms. The shift in retina care toward expensive injectable drugs has created high levels of cash flow, which has caught the attention of PE. In general, PE firms hope to find critical practices (known as platform practices) in a given market and use them to expand, creating economies of scale, higher revenues, and, potentially, greater profits. For more information on private equity, click the cover above. Guarav K. Shah, MD: Ophthalmology practices, and specifically retina practices, are appealing to PE firms and investors because ophthalmology procedures are typically well reimbursed by insurance carriers and because ophthalmology practices often have the potential to perform a number of elective procedures that do not rely on discounts made to insurance providers. With regard to retina practices in particular, there are significant margins on drug revenue that can be capitalized for profit by the PE firm. The end goal of these firms is to increase the stock value of the ophthalmology practice so that it is worth more than when it was purchased in order to produce a significant financial return for investors—on the order of 20% to 25%. Dr. Su: How does purchase by a PE firm affect the physicians working in these practices? Dr. Vander: These transactions are typically structured such that the physician owners of the practice remain employed by the practice and must stay with the practice for a certain amount of time. They also remain minority owners. Ultimately, the majority owner (the PE firm) can and will exercise its authority to create change. If a practice has been poorly managed from a business and clinical perspective, these changes may be to the benefit of all concerned. However, it is more difficult to create increased profitability for a historically well-managed practice. Decisions will likely be made that will enhance the net profit for the PE firm but that may not be the preference of the physicians and that could negatively affect both staff and patients. Dr. Shah: As Dr. Vander said, the structure of the PE-purchased practices will certainly change over time. It depends on the management that is put into place in these practices at the time of the transaction. If the practices are well managed to begin with, the changes the PE firm makes may be minimally disruptive, but there will be changes. Those changes may deal with the day-to-day operations of the practice, things such as hiring and firing employees and back-end operations of the practice. The physicians may or may not have a say in the decision-making process; it depends on the voting structure of the corporation. At the end of the day, decisions will be made that work toward the No. 1 goal of the PE firm, which is to make the new corporation more profitable than it was before. Sometimes these changes can be beneficial to the practice, but keep in mind that you may not have a say in those changes or, more important, in how those changes are implemented. Dr. Su: What does this mean for the graduating fellow looking for jobs, and what practical advice can you offer? Dr. Vander: The existing owners of the practice trade control of the practice for a substantial front-end cash windfall when they sell to a PE firm. An employed doctor who is not yet an owner does not typically derive that cash benefit. As with all aspects of the job search, the key is to do your homework, ask questions, and, to the extent possible, learn about who your future partners are and how they think. Find out what is happening in that particular market in terms of PE activity, past or present. Ask all of your future partners what their position is on PE. Critically important is learning how the shareholder agreement is structured. If the practice is owned by one or two senior doctors who can sell without the consent of junior doctors, that is potentially a concern. If sale of the practice requires a large majority that includes the voices of the more junior partners, who are much less likely to find a PE deal appealing, that is reassuring. Ask if protection can be included in the employment agreement, even if it is simply a monetary penalty if sale to a PE firm occurs. Dr. Shah: In addition to looking at the marketplace in the region, it is also important to talk to the people in the community about whether PE firms have entered or are considering entering the marketplace. The most important thing for the fellow to consider in terms of contracting is the restrictive covenant. If the practice is sold to a PE firm, the restrictive covenant may not be applicable to them. Most PE firms, if they have done their due diligence, won’t want younger associates and/or partners to leave the practice, because those doctors are typically the backbone of the practice, and PE firms would not want the practice to face economic losses after they have purchased it. Dr. Su: How will this trend play out? Is PE here to stay? Dr. Vander: This feels like déjà vu all over again. This is at least the third wave of serious anxiety over outside entities taking over retina practices in the past 25 years. Each time, the sky was most certainly falling, but after a few years, the process played out with business as usual. Could this time be different, and could there be long-term structural changes across the country? Yes, of course. But, ultimately, I think the music will stop playing, PE will drift away to the next fashionable destination, and we will return to a more familiar environment. Dr. Shah: I think that the current health care environment is conducive to the PE market, but PE firms still face challenges. There is certainly a good chance of PE firms continuing on in some fashion because they bring in better integration of health care services and better electronic health record systems that allow closer integration of large health care groups. Whether this trend will continue or not will depend on the marketplace in a given location. There may be some areas in which PE firms cannot get much of a foothold and others in which PE will take hold and become an important player.